For many centuries the Chinese have been engaged in traditional medicine that is very unique and highly effective. Oriental medical art as I would love to refer to this brand of medical health practice, has since soared beyond the borders of even the Asian continent to Europe, the Americas, and even the rest of the world. Acupressure is an art of healing derived from the world famous Acupuncture. Acupuncture being a well known traditional Chinese medical health practice, has been well adopted, and adapted to modern western medicine. I am not going to be dealing with this ancient Chinese healing practice, but rather, we shall be borrowing an aspect of that same medical art to see how it has been possible to achieve relief and also healing for stress and stress related conditions – a process known as acupressure. Acupressure thus borrows from acupuncture in that it has to do with the ‘manipulation’ of the particular points or acu-points on the body that are linked to various organs of the body in order to achieve wellness, except that needles are not applied. These points are found everywhere on the body; you find them on the feet, hands, palm, head, neck, buttocks, chest, back, legs, etc. The points are referred to as acupressure points whereby they are massaged or manipulated for a proper flow or circulation of blood in the system, and to the vital organs concerned. 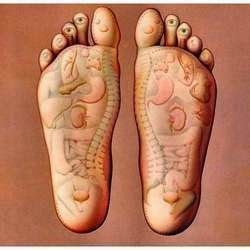 It is on this philosophy and fact that acupressure has also emerged as a practical and proven means of administering natural healing and relief to so many ailments including stress. Acupressure therefore is the treatment of symptoms by applying pressure with the fingers to specific pressure points on the body. These points as I stated earlier, are linked to vital organs in the body which equally respond to the manipulations, such as the kidney, heart, brain, gall bladder, eyes, spleen, stomach, and pericardium, etc. According to the founder of the Acupressure Institute in Berkeley, California - Michael Reed Gach, M.D, two points at the back of your neck known as ‘Gates of the Mind’ can relieve you of stress and give you clarity of mind when manipulated correctly. He says for instance, if you press these points you can get rid of, or prevent an impending headache.